The American land trust movement was in its infancy in 1967, but the notion of conserving important natural lands was already well-established. In the spirit of Teddy Roosevelt, two generations of the Miller family of Pittsfield, Massachusetts – owners of The Berkshire Eagle – had been pursuing park and open space conservation as a private passion. They knew land needed to be preserved for all of us. Donald B. Miller, the Eagle’s publisher, was convinced that his interests in conservation and rural beautification demanded institutional backing. Concurrently, George S. Wislocki was trying, without much success, to establish a land trust in the Hudson Valley of New York. Charles W. H. Foster, the commissioner of the Massachusetts Department of Natural Resources , brought the two men together. In November 1967, the partnership was forged and Miller’s nephew, 34-year-old attorney Kim Burbank, filed the organization’s papers with the state and federal authorities. Miller recruited a board from the corner offices of the county’s leading corporations. First among equals was Frederick G. Crane, Jr. of Dalton’s Crane & Co. In those earliest days, Wislocki looked for work wherever it could be found, filing grants for open space monies on behalf of municipalities, mounting campaigns to clean up rural blight and promoting the notion of conservation and ecological restoration to whomever would listen. The protection for public purposes of Brattlebrook Park in Pittsfield and Gould Meadows in Stockbridge were landmark examples of Berkshire Natural Resources Council’s early approach to conservation—to help towns and cities find the money to buy land. The direct acquisition of land by the Council was almost an afterthought for an organization that no one was sure would survive from one fiscal year to the next. The 1971 gift from the Hatch and Stokes families of land on Yokun Ridge that today hosts the Olivia’s Overlook trailhead was the Council’s first step to permanence. The passage of state legislation sanctioning perpetual conservation restrictions was a second. In 1972, Frederick Crane, Sr. and Berkshire Natural Resources Council used this new legal tool to protect 1,900 acres of Holiday Farm in Dalton. It was one of the state’s first conservation restrictions, and remains today the single largest transaction in the Council’s history as measured by acreage. In the 1980s and ‘90s, while continuing to pursue Berkshire Natural Resource Council’s conservation work, Wislocki encouraged and facilitated the creation of local land trusts in a dozen towns around the Berkshires. The Williamstown Rural Lands Foundation, Monterey Preservation Land Trust, Stockbridge Land Trust and Sheffield Land Trust were among the pioneers of what has become a highly accomplished assembly of town land trusts. Don Miller died in 1972. His brother Lawrence K. Miller, known as Pete, succeeded him on the Council’s board. Fred Crane, Jr. succeeded Don Miller as chairman, leading the Council’s board until 1992. Lewis Scheffey of Monterey then chaired the board from 1992-2001, followed by Walter Cliff of South Egremont in 2002. Tim Crane succeeded Cliff as board chair in 2015. Kim Burbank – the young attorney who gave legal life to the Council in 1967 – passed away in June 2015 after nearly 50 years of board service and a distinguished legal career that included thousands of hours of pro bono service to Berkshire Natural Resources Council and other conservation charities. George Wislocki, Berkshire Natural Resources Council President Emeritus, retired at the end of 2001. He remains a trusted counselor to the Council’s staff, and has continued to make vital contributions to the Berkshires through his service to Project Native, Berkshire Grown, Green Berkshires and other groups and initiatives. Tad Ames, who has worked at Berkshire Natural Resources Council since 1990, was appointed president of the organization in January 2002, succeeding Wislocki. Today, Berkshire Natural Resources Council and its supporters are pursuing plans and lands to create the Berkshire High Road. This vision of connecting the trails and hikes of the Berkshires to the charming towns and world-renowned cultural institutions is already underway. Learn more about the Berkshire High Road. Many men and women have left a mark on BNRC and the Berkshires with their commitment to conservation and stewardship. Bob Thieriot, a native Californian who made Monterey his home in the last decades of his life, deserves special mention. Thieriot, whose family owned the San Francisco Chronicle, had little interest in his inheritance except as a means to buy and conserve tracts of land in his adopted home. In 1998, at the age of 52, he was stricken with brain cancer. He died on New Year’s Eve, leaving a financial bequest and some 3,200 acres to BNRC. Thieriot’s legacy spurred BNRC to get serious about land stewardship, and provided stability that has allowed BNRC to become more proactive and strategic in its conservation efforts. 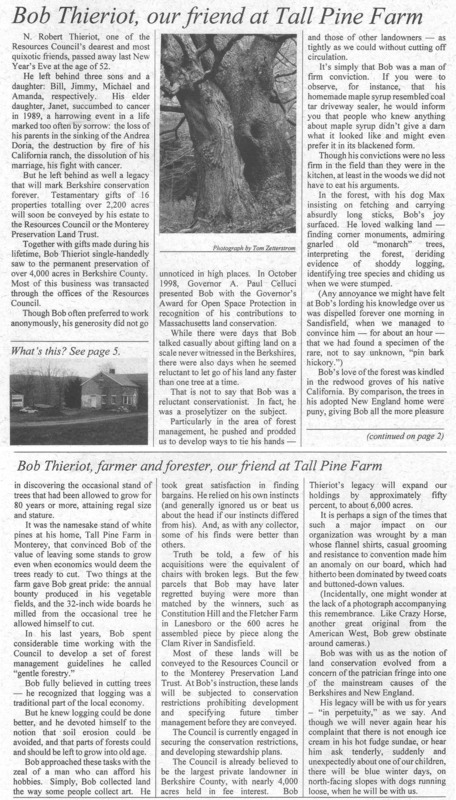 Bob’s Way in Monterey, Constitution Hill in Lanesboro, and the Clam River Reserve in Sandisfield are among Thieriot’s notable gifts to the Berkshires.